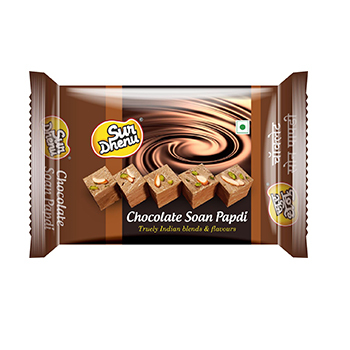 Chocolate Soan Papdi is one of the best variety in wide range of Soan Papdi products. Surdhenu which is a leading manufacturer of Soan Papdi in India, prepares this Soan Papdi and it is served across cities like Mumbai, Nagpur and many more cities in India. We also export Chocolate Soan Papdi and other types of Soan Papdi to foreign countries. Soan papdi (also known as patisa, son papri, sohan papdi or shonpapri) is a popular North Indian dessert which is a main dish in all functions in North India. There are many types of Soan Papdi present in the market, Chocolate Soan Papdi stands first in the terms of taste and sales. As Soan Papdi is mostly consumed in many parts in India, We tried our best to make the soan papdi recipe more tastier and healthier. This was made by professionals which are best soan papdi makers in the market and they had worked very hard to make our sweets more tasty. Surdhenu has a wide varieties of sweets ranging from Soan Papdi,Gulab Jamun, Rasagulla and Mishti but chocolate Soan Papdi is voted as No.1 sweet by many people. We have experimented with many flavors in our food lab and finally Chocolate Soan Papdi has made its entry into the market. Made of Sugar,Refined Palmolein Oil,Wheat Flour,Chick Peas Flour,Cocoa Powder,Cocoa Mass,Skimmed Milk Powder,Liquid Glucose,Almonds & Pistachio, Chocolate Soan Papdi has more taste and is the perfect replacement for Chocolates also. Cocoa powder and Cocoa mass brings the unique taste to the sweet and all the other ingredients are most edible and will satisfy your sugar cravings. Now-a-days children are shifting from eating chocolates to eating chocolate soan papdi especially the one which is prepared by the Surdhenu. We believe that a healthy body is essential for healthy mind; so keeping this aware we have included all the essential nutrients which are required for the kids to grow. We are also suggesting to the parents that please replace your kids snacks with Surdhenu soan papdi and this will definitely help your child in his/her growth. Made in safety and hygienic environment this product is the best choice as snacks in your kid’s box.